It has been a tournament to forget for Russia. Events off the field have been so pronounced that they have caused political ramifications between Russia and the host country. The Russian team might well be thankful for these disruptions as it has diverted attention from their awful efforts on the pitch. One gets the impression that they wouldn’t be unduly concerned if they were to beaten here and allowed to quietly shuffle home without too much fuss. After the euphoria of their victory over Slovakia in round 1, Wales came back to earth with a bump in their loss to England. Despite all the pre-match hoopla about their players being better than England’s yada yada, it was the Welsh players who looked woefully out of their depth. Despite the wonderful ridiculousness of Gareth Bale’s long-range free-kick, Wales offered next to no threat and could do little other than defend deep. Nothing less than a win will do for Russia if they retain any hopes of progressing to the next round but little in their performances to date suggests that they can do so. Wales certainly aren’t the team that they believe themselves to be but equally they are better than their performance against England would imply. Somewhat surprisingly, the bookies have Russia installed as favourites but if you harbor a fancy for the Wales win, BetVictor has a price of 21/20. How Slovakia must rue their opening game loss to Wales. 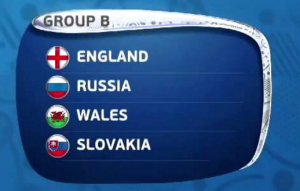 Even though they handily accounted for Russia in round 2, those dropped points mean that they are level on points with Welsh and are in a straight race with them for, depending on results, 1st, 2nd and 3rd place. Pretty much all to play for, so. Following a double half-time substitution which saw both Daniel Sturridge and Jamie Vardy enter the field of play, England began to display the attacking prowess many suspected they possessed. Both players scored and are likely to be in the starting 11 for this tie. That doesn’t bode well for the Slovakian defense, especially given Martin Skrtel’s propensity to give away needless fouls. Could England finally become the team that they’ve been dreaming of for the last 50 years? Probably not as, although they impressed in the second half against Wales, they have yet to be put under sustained pressure in midfield, the part of the pitch that Wayne Rooney now calls home. Although he has been relatively effective at spreading the ball from a deep position, he has yet to do so under any kind of concerted pressure. Marek Hamsik, an incredibly accomplished midfielder himself, will look to test him, of that you can be sure. It’s a tough enough game to call as both sides have their merits. England have arguably the better team but inspired by Hamsik, Slovakia can pose a serious threat. The market fully expects England to prevail and has them at less than evens. The price of 5/1 from BetFair amongst others for a Slovakia win is well worth a look.